Dreams are life. I’m a dreamer, no really I am! I have vivid dreams, and sometimes spend days recollecting them. I realised I’m a total dreamer when Zaara asked me why I spent time staring at her and Aaira, I was taken aback by her question, but I realised it was true. I told her I was trying to capture every moment of their lives in my mind as beautiful memories, because they were just growing up so fast! And wanted to be dreaming of them all the time! She seemed content with my answer and went on about with her drawing. Then again, I also dream through the day about my projects. In my mind I’m never happy with whatever I do, I always want that extra minute to do more, detail more, think more, more and more.So when we have a project complete, and everyone says they love it, I bicker in my mind about the small things I would’ve done differently and sometimes its conflicting as the client would’ve loved it nevertheless! But then, I still love it like my baby, defending and protecting what I have achieved in my mind. Its like a 3d coming out of your head, You imagine it and the various colours, finishes,fabrics and flooring makes it what you dreamt! Imagine touching your dream! That’s what i felt when I walked into peppermill days before its opening. Running my hand through each groove, each table and upholstery, I felt proud. A few days after it opened its doors to some rave reviews( their food is awesome) and a mention here and there on its decor,I got an email from someone who visited the restaurant. Peppermill is a colonial Indian restaurant. 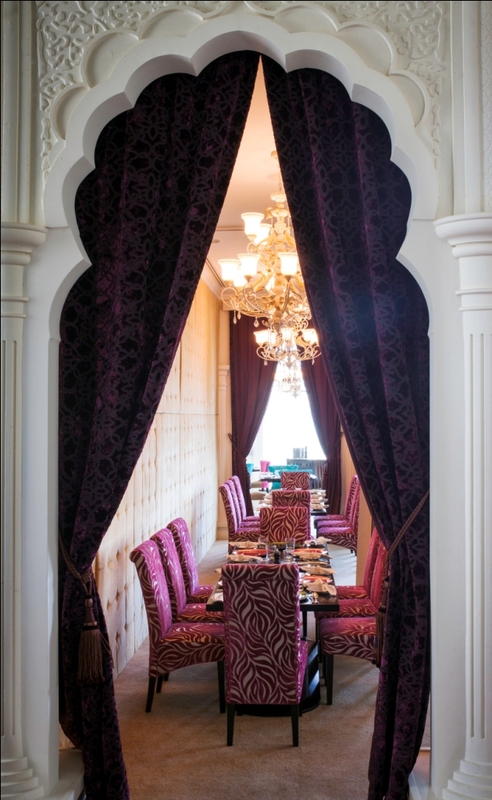 It has the colonial richness of the time where the Raja’s were giving up their powers to the British and the cuisine revolves around that period.We have no shortage of Indian restaurants in Dubai or Abudhabi(where the new Peppermill is located) But I would be proud to say that this is the ONLY colonial Indian restaurant.Hence we waiver from tradition with colours and prints- as you may see in the images. I thought It was amazing to have someone write to you about your work. Trust me when I say that It doesn’t happen often.And I’m so thankful!No I don’t think I’m the best designer, But in my mind, I have a dream and each project takes me closer to that. On that particular day, I was feeling a little low, and overwhelmed, and this message came to me just before bed. I was so thankful it did, It made each day better and I jut felt that I was doing the right thing. 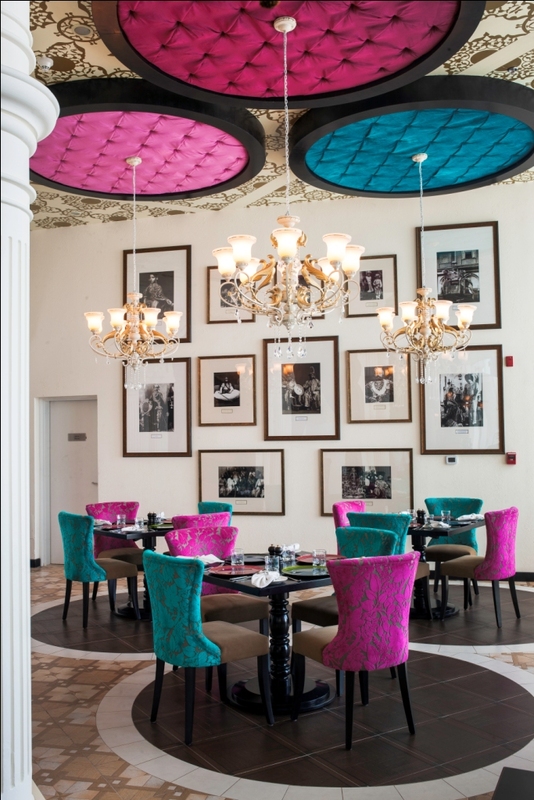 Peppermill is conceived as a bright colourful colonial dining restaurant. 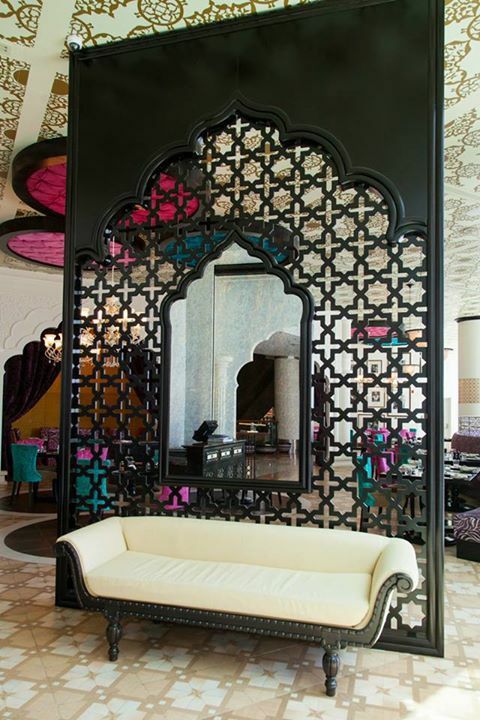 The entrance is adorned by a lattice with an antique mirror,its an entrance element which works as a little peephole for the restaurant to the world.It had to have Indian elements with copious amounts of colours and grandeur. We had to feel palatial,and the height helped us. At a staggering height of 4.5mtrs, we had to have chandeliers on extensions to make them look at a human scale. We faced our own set of challenges, from getting the floor done with rustic tiles, to getting fabrics and curtains with prints that work at these heights.The colours bring in memories of holi- the blues, purples and the fuscia, its like you have ran over a palace with colours in your hands, playing with your family, smearing each other in colour.I would love to hear from everyone who has visited. Would be an honour to hear from you. very beautiful dins!!! cheers!! and all prayers for u to keep rocking !! !